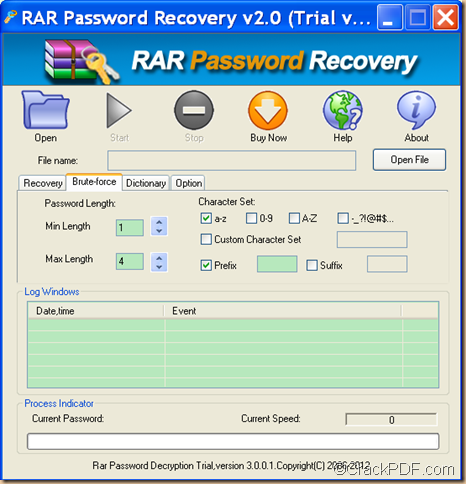 The application RAR Password Recovery is able to help you unlock encrypted RAR/WinRAR files with easy operations. RAR (Roshal Archive) is a file format that supports data compression, error recovery, etc. RAR archive is a file that contains one or more compressed files. It can be spited into smaller chunks for easy emailing and burning. 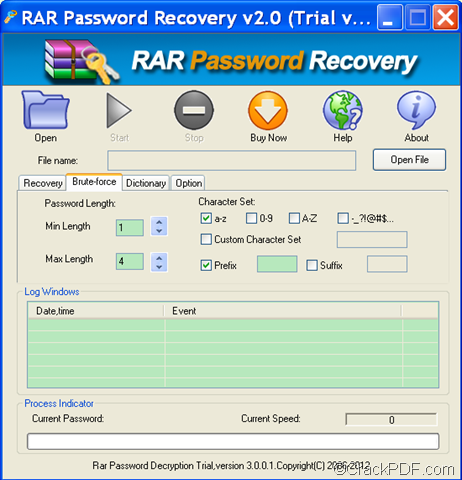 RAR Password Recovery is a smart utility that can recover passwords for password protected RAR files with Brute-force with Mask Attack if you are able to recall part of the RAR password such as the length of the password, character set, prefix, suffix, etc. In the following contents, you will see how to use this method to unlock RAR files which are password protected. 1. Please download RAR Password Recovery, and then install it on the computer by double clicking it and following the setup wizard. After opening the application, you can see the user interface of this application. 2. Please add the encrypted WinRAR archive into the application by clicking the Open button in the tool bar on top of the user interface or the Open File button beside the “File name” input box. In “Min Length” and “Max Length” spin boxes, you can set maximal or minimal password length. In the “Character Set” group box, you can set the password in pure numbers, lowercase letters, capital letters, etc. You can also customize the character set. In “Prefix” and “Suffix” input box, you can set prefix and suffix. 4. Please click the Start button in the tool bar on top of the interface to recover the RAR password. By following the above steps, you can easily master how to use this application unlock the encrypted WinRAR archive. In the end of this article, if you are interested in this application, please download RAR Password Recovery by clicking the following button.